Earlybird pricing - $5 off, per ticket! The Maruki Community Orchestra (MCO) is an innovative community symphony orchestra devoted to all musicians in Canberra region - regardless of age, experience and skill level, who have strong interests in playing classical musical instruments in an orchestra environment and who wish to develop their skills and express their musicality. MCO enables its players to achieve successes not otherwise possible in a positive, encouraging environment. 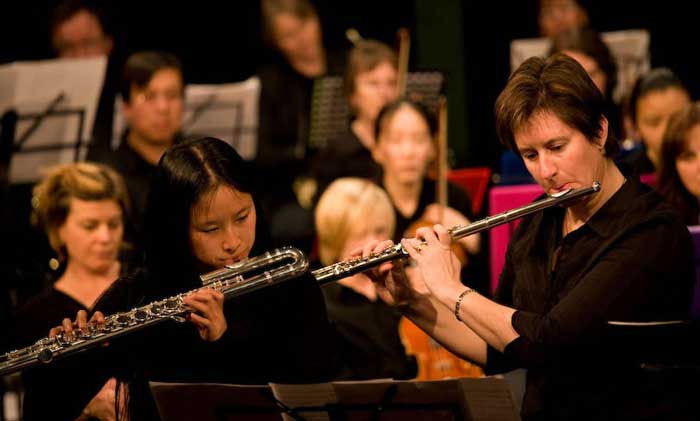 We also develop these talents by playing in ensembles and smaller chamber orchestras - which extends well into the community's requirements for smaller orchestras able to play in smaller community performance spaces - at festivals, in special places such as homes for the aged, and at events at our national institutions. Above all we are a community of enthusiastic musicians who not only enjoy exploring beautiful music, but also each other's company. To this end our rehearsal afternoon teas and musical soirées are legendary! MCO is a very special community music project. Please explore this website to find out more. New members or enquiries about our activities are always welcome! We rehearse most Saturdays (2pm - 5pm) at St Thomas More Catholic Church in Campbell.